Famed Ghanaian actor, Majid Michel who is mourning the unfortunate death of his mother, is also contending some unscrupulous persons who are using the unfortunate incident to enrich themselves. 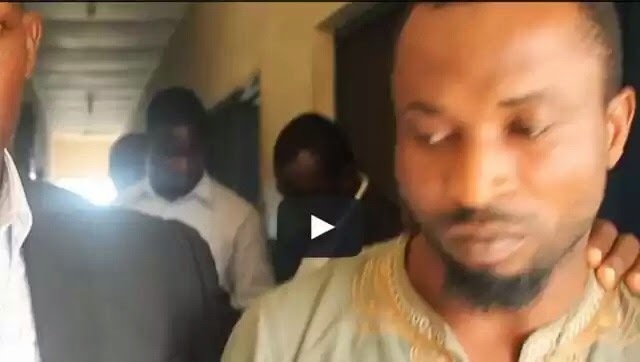 One of such persons, Kelvin Ogodogu, a Nigerian, is in the grip of the police for posing as Majid Michel and defrauding a US-based lady over some dollars, which was supposedly meant to help in the preparations of his mother’s funeral. Narrating the ordeal to ‘Razz’ Newspaper, Majid stated that, he was in the United States recently when he met a lady by name Ikay at an event. Ikay was said to have approached him and told him about their chats on social media and also hinted on the monies she’s been sending him. According to Majid, the lady even said that, he (Majid) informed her of his mother’s death and requested for an amount of $5,000, an amount she was willing to send. Majid said that, he protested his innocence but the lady was insistent and argued that it was him (Majid) who had engaged her over a period of time on social media, collected previous monies and recently requested for $5,000 for the funeral. At this stage, Majid explained to the lady that she was not the only victim to lots of these scams where people use his name and profile to defraud unsuspecting people. The actor explained to the lady that, another lady in Canada was scammed out of a staggering amount close to $30,000. Majid, together with Ikay decided to work together to trace and find the person behind the scam. They called his brother in Ghana, Mawuli and the lady forwarded the details of the culprit and involved Ghana Police in investigating the case. According to the actor, Kelvin initially wanted the money transferred through Western Union and to his real name (Kelvin Ogodogu) and when he was questioned on why the money wasn’t being transferred to the name Majid Michel, he claimed that the name, Kelvin Ogodogu, was the name of his movie director. With advice from the Police, Kelvin was asked to go take the money from a friend of Ikay, but in a smart move, he also sent a friend to collect the money – that friend was arrested and led the Police to apprehend the real culprit, Kelvin. Narrating his side of the story at the Police Station, Kelvin claimed that, the name Majid Michel is his nickname, and when he was in Nigeria, he used to love the actor and his movies, to the extent that, his friends started calling him Majid. According to him, when he got to Ghana, he continued using the nickname until one day; Ikay initiated a conversation and they started chatting on social media. Sergeant Daniel Ziga of the La Police Station says the culprit will be arraigned before court.